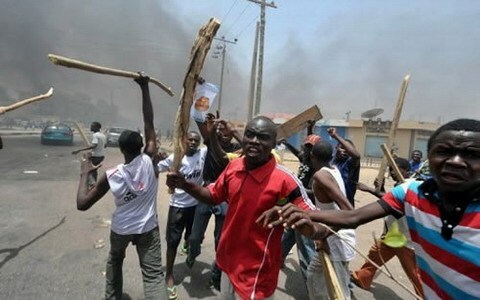 Leaders of the Igbo community in Kaduna State have alleged that some of their kinsmen were still missing following the riot that broke out in the state few weeks back. Recall that a communal crisis erupted at Kasuwan Magani, Kajuru Local Government Area of the state where several people were killed, many houses and other property were burnt by rioters. The Chairman, Igbo Community Welfare Association (ICWA), Kasuwan Magani chapter, Mr. Tobias Udeh, speaking to Sun said “As I speak to you, I cannot locate some of our people. We don’t know whether they have relocated to the East or to the neigbouring communities. “We are still searching for them. But all we know is that they are alive. We didn’t lose any Igbo man. But we don’t know their whereabouts. Many Igbo lost property worth hundreds of millions of naira. “I personally lost millions of naira following the burning of my property. It was not quite long I received fresh supply that the place was set ablaze. “On the day of the incident, I went to one village to buy chicken for the celebration of my birthday which I always mark on February 27 of every year. I left my house as early as 6:00a.m and by the time I returned around 9:00a.m, I discovered that my wife was not in the house. One of my children told me that she had travelled to Kaduna town to buy some items. “I went to my shop where I operate patent medicine shop, and later went to the other shop where I do wholesale on soft drinks. I made sure that I put things in order for my workers every day before I go for other business. “But after few minutes, I saw people running helter-skelter, and I asked my daughter what was the problem after I left the house in the morning? “My daughter said that some people wanted to covert a Christian girl to Islam, and her parents did not want that and so they forced their daughter back home. She said there was commotion everywhere, and the youths started taking laws into their hands. “We did not take away a pin from the place. The place was looted before it was set ablaze. So many shops were burnt to ashes. I have been living in Kasuwan Magani for more than 30 years now, but I cannot explain why Igbo are always the target whenever incidents of this nature occur. Igbo people don’t have problem with anybody but they are always the big losers.